Our Knife Of The Day for Feb. 22 is John Bartlow’s utility hunter in a 4-inch blade of ATS-34 stainless steel and a handle of bark elephant ivory. 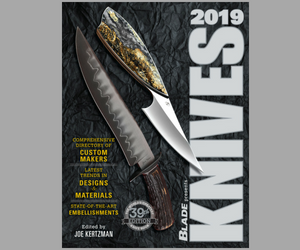 Winner of “Judge’s Choice, Hunting/Utility Knife” at last year’s Professional Knifemakers Association Show in Denver, the knife is 8 5/8 inches overall and boasts Bartlow’s trademark line cutter/choil where the edge of the blade begins. For more information e-mail John at jbartlow@bresnan.net.